Battle Class Destroyer. 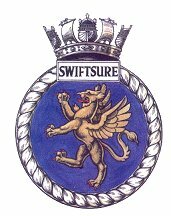 One of sixteen: Armada, Trafalgar, Barfleur, Camperdown, Solebay, Hogue, Finisterre, Saintes, Lagos, Cadiz, St. Kitts, Gravelines, Sluys, Gabbbard, St. James, Vigo. A further eight were added later: Barrosa, Agincourt, Matapan, Aisne, Alamein, Corunna, Dunkirk, Jutland. Specifications: 2,310 tons. Laid down 1942 - Hawthorn Leslie. Completed 1945. Complement 250. 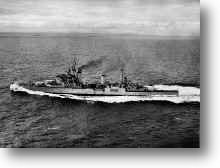 1946-53 - Leader 5th Destroyer Flotilla, Home Fleet. 1953-57 - Reserve, Chatham. 1957-59 1st Destroyer Squadron, Home/Mediterannean. 1959-60 - Far East. 1960-62 Home/Mediterranean. 1962-67 - Replaced Vigo as Harbour Training ship, Portsmouth. 1967 - August 7th Towed from Portsmouth to Troon to be broken up. Battle Honours: St Kitts 1782. 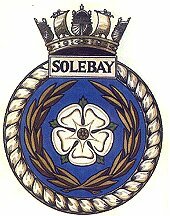 H.M.S Solebay named after the battle of Sole Bay (Southwold) where a sea-battle took place against the Dutch in 1672. Specifications: 8,800 tons. Laid down - September 1941 (Vickers Armstrong.) Completed June 22nd 1944. Complement: 855. 1944 - 10th Cruiser Squadron. Home Fleet. 1944-45 - 4th Cruiser Squadron. British Pacific Fleet. 1945 June 16th - Surrender of Hong Kong was signed onboard. 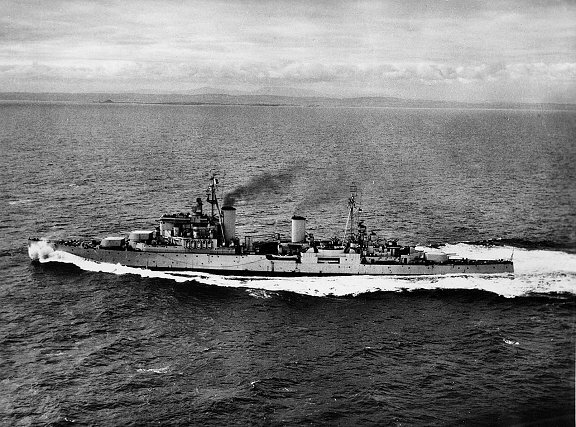 1946 - 4th Cruiser Squadron. East Indies. 1946-49 - Reserve. 1949-50 Refit. Rosyth. 1950-53 Flag Officer Flotillas. Home Fleet (Badly damaged in collision with H.M.S Diamond 60 miles off Iceland.) 1953-55 - Refit, Immingham. 1955-56 - Laid up.Gareloch. 1956 - Modernisation, Chatham (1960 modernisation abandoned). 1962 - Broken up, Ward, Inverkeithing. Battle Honours: Armada - 1588. Cadiz - 1596. Santa Cruz - 1657. Lowestoft - 1665. Four day's Battle - 1666. Schoonveld - 1673. Texel - 1673. Barfleur - 1692. Vigo - 1702. Gibraltar - 1704. Velez Malaga - 1704. Lagos - 1759. Quiberon Bay - 1759. Bellisle - 1761. Nile - 1798. Egypt - 1801. Trafalgar - 1805. Suez Canal - 1915. Dardenelles - 1915-16. Okinawa - 1945.